Construction of perpendicular lines by using a protractor is discussed here. 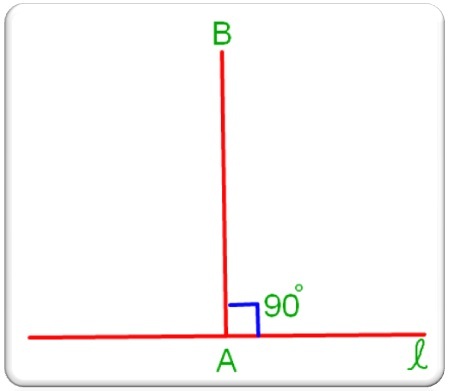 To construct a perpendicular to a given line l at a given point A on it, we need to follow the given procedure for constructing an angle of 90° at A. 1. Let l be the given line and A the given point on it. 2. Place the protractor on the line l such that its base line coincides with l, and its centre falls on A. 3. Mark a point B against the 90° mark on the protractor. 4. Remove the protractor and draw a line m passing through A and B. Then line m ┴ line l at A. These are the steps to construct a perpendicular. Construction of Perpendicular Lines by using a Protractor. Sum of Angles of a Quadrilateral.